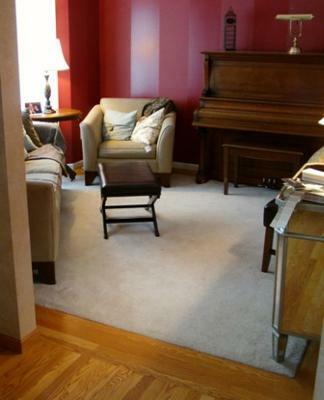 The best wood floor stain color for this room had to work with white enamel trim, burgundy walls, and a dark honey tone upright piano. 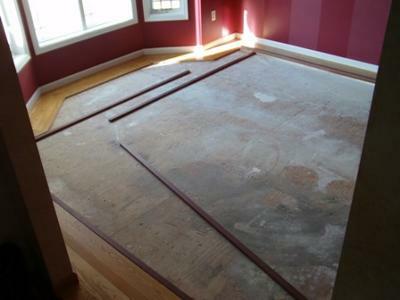 Removing the carpet seemed to enlarge the space, visually. 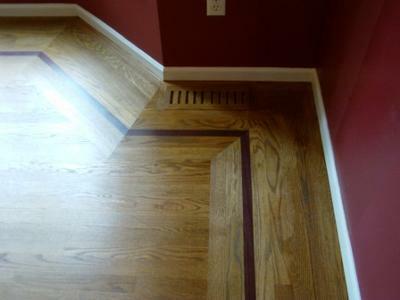 The existing hardwood floor was a frame around a carpet insert. The homeowner liked the idea of keeping the frame and, in fact, featuring it with a single pinstripe of Purpleheart. Straight ShadeMaker Antique was the first sample, followed by straight Golden. The third sample was a 1 to 1 ratio of these two colors. Next, came the TreeSap Toner to lighten a bit at two different ratios. 1 Antique to 1 Golden to 4 Toner and 1 to 1 to 2, respectively. The latter was chosen. Join in and write your own page! It's easy to do. How? Simply click here to return to Custom Color Contest.